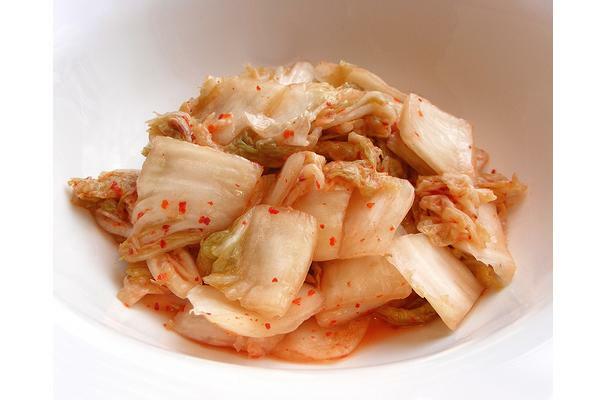 Kimchi is fermented cabbage, carrots and radishes, among other vegetables in a spicy liquid consisting of chilies, garlic, ginger and onions. Nappa cabbage is often the type of cabbage used. Hundreds of different varieties of kimchi are available in Korea. Many families have their own recipe for kimchi. Kimchi is served at almost every meal in Korea. To make kimchi, you need to clean and throughly salt a nappa cabbage and let the water inside the cabbage drain overnight. After rinsing to remove the excess salt, you rub the leaves with a mix of hot pepper powder, ginger, garlic and sugar (optional). Every Korean housewife has her own special variation that might include shrimp paste or raw oyster. Put into a sterile jar and allow to sit a room temperature for a few days before putting it into the refrigerator. Kimchi is served as a complement to every Korean meal whether it's breakfast, lunch or dinner. No Korean table would be complete without a serving of kimchi. If you made your own, make sure to pack the mixture tightly in sterile glass jars and cover with the juice. If you have bought it pre-made from the grocery store, make sure to store it in the refrigerator to slow down the fermentation process.